Companies interested in placing a 3-month announcement of position available please complete the Job Announcement Form and submit with payment to AMTA at publications@amtaorg.com. A separate form needs to be submitted for each position. 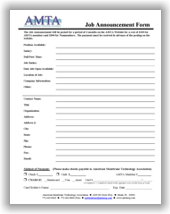 Individuals interested in placing a 3-month announcement of jobs wanted please complete the Job Wanted Form and submit with payment to AMTA at publications@amtaorg.com. If you have any questions, please contact Alie Griffin at 772-463-0820.